Picture yourself still alive in the future. Perhaps after the new world order is fully operational (2030 or beyond). By then perhaps it's too late. Humanity had become enslaved forever. Imagine a large percentage of humanity is now dead and gone. Billions succumbed to various diseases all linked to toxins and diseases that you now realize could have been easily avoided. The human species, you now realize, became victims of their own corruption, greed, subsequent policies and mind games. The species had become so locked in to their pre-determined paradigms that by the time enough people began to think on their own too many of them died off one way or another. The "war on terror" that never did seem to end turned out to be the perfect tool to rationalize permanent war against everyone, anywhere, everywhere and at anytime. The human species essentially killed itself off. All along while one tiny segment of the planet known as the globalists, financial elite or illuminati operating under the guise and interest of nation states all danced along to a script they had laid out many years prior. The script told the story of how they were going to kill everyone off to conquer the world. The generations that lived during that time, as a whole ignored the warnings. Truth seekers, revolutionaries, independent journalists and alternative news entities kept warning for years about this out of control top-down corruption and many other ongoing conspiracies but the overall complacency of the species did not allow for quick enough significant action to take place to stop this agenda. Before we knew it, it was too late. The wars, the fatalities, the depopulation agenda had all finally come to fruition. The human suffering immeasurable and unimaginable to the average mind would be blocked from sight and mind. Most people alive and surviving in this new world order system would be constantly subjected to wireless signals that provide news and entertainment and control what you see and hear. So if a person doesn't see the suffering, then to that person it's as if it's not happening. And there you are, in the future, seeing all of this. You awaken and you are surrounded by children of the future. In the future some of these may be your children, some may be neighbors, acquaintances, distant friends and even strangers. The young children want to know something and they look to you with their most important question: How did this happen? You search for an answer and before you know it the children one by one ask you more specific questions. The permanently enslaved children ask questions that they hope you can answer. You then think to yourself, wondering what will you say to these children of the future to explain to them what your role was in preventing these now very key issues that the generations of the future will demand answers for. 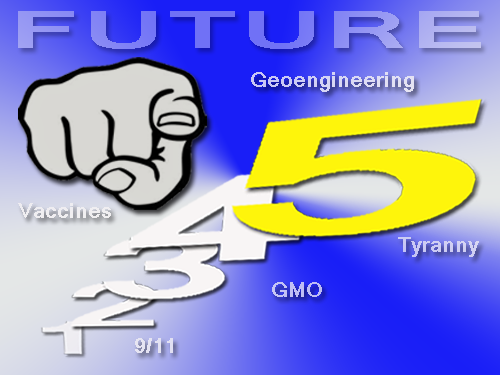 In the future, will you have an answer for these key issues that sealed the destruction of humanity? When the time comes, will you be able to answer to future generations and confidently say you did your part to stop these events. What events are these? Here's a small list for you to think now of what you will say on behalf of yourself for allowing the following crimes to take place while humanity did nothing about it when they had a chance to stop it. 1- Over a decade of geoengineering and in-your-face weather manipulation. In the distant future, after humanity's DNA is permanently contaminated from breathing aerosolized metal particles, what will you say you did to stop chemtrails chemical spraying and daily aerosolized nano-sized metal injections in the atmosphere? Will you be able to tell future generations that you did all you could to stop chemtrails and chembomb artificial cloud seeding to manipulate the weather? When the pH of the system is unsustainable for life, when the ecosystem equilibrium is thrown off, when the nutrients of the earth and ocean are fully contaminated and ongoing extreme weather and climate changes destroys the essence of our planet due to geoengineering crimes- what will you say your role was in stopping this? Will you be guilty of showing outward passion about the climate all the while ignoring years and years of in-your-face global spraying operations spraying dangerous metal particles in the sky that went straight into the ground, the ocean and into your lungs compromising the essence and vibrancy of humanity and the planet? After over a decade of absolutely illegal wars, torture, war crimes and revelation of mountains of evidence implicating a very long list of political criminals in the 9/11/01 globalist terrorist attacks, what will you say to children of the future when they ask how did your generation allow the criminals who orchestrated this event to get away with it for so many years? Will you have a good answer? Will you be able to say that you did everything you could to stop the cover-up, expose the lies and seek true justice? When the children of the future read about the overwhelming idiot-proof evidence explaining every detail of the 9/11 globalist terror attacks, and when they hear about how this evidence was freely available to humanity the whole time, what will you say to them to explain how justice was never served? Think about this. What about when future generations find out that, especially in America, people convinced themselves with Monsanto paid-for propaganda that it was somehow "safe" to eat genetically contaminated food every day and to ignore the simultaneous rise in cancer and many other medical diseases across the board amongst males, females, adults and even children? How will you get out of this one? We're talking a mass program of progressive stupidity and ignorance that the species decided to suicidally and hypnotically accept to poison their own DNA by poisoning their own food supply so that a small group of people representing several large corporations could profit by imitating the food resource of the planet. Do you have your story ready? Because future generations will want to know if you threw them under the bus and allowed them to eat proven poison without telling them what they were eating. Will you dissociate yourself from this mass stupidity? Will you be able to show a body of work that you did to stop this? 4- Tons of toxin-laced vaccines injected directly into newborns- no accountability, no proof of safety, no problem! Speaking of contaminating the DNA of the human race, a pregnant woman and her baby are one of the most amazing things humanity will ever encounter. It's the start of a new life and the power of nature is at work. The miracle of life is the ultimate miracle of them all. So if challenged by those in the future, what will you say when they ask you what you did to stop the poisoning of the newborn humans from a long list of mandatory chemical injections, none of which had been proven convincingly safe to the species? This single process of forcefully injecting a laundry list of proven unsafe chemical vaccines saturated with "trace" amounts of deadly toxins into the human newborn may prove to be the crime that you will have the hardest time explaining. Can you imagine the questions a future generation would ask? How can any company be allowed to create chemical compounds that are directly injected into newborns, while at the same time not being held accountable for the damage their chemicals eventually cause? This may sound like a scene from a monster movie thriller but it' not. Many will ask in the future. Where was the logic in this? Who was looking out for the safety of the innocent newborn? How can it be that none of these chemical vaccines had been proven safe to humans yet were allowed to be directly injected into innocent babies at such high frequency? Will you be able to tell someone in the future that you did everything you could to stop this mandatory chemical injection madness? The madness in this is worse than we think. Don't you think future generations will realize there was a choice all along beyond just being controlled by a bunch of idiots at some global top level political platform? Some will surely ask- how about plain old freedom and self-governance? Or how about some kind of version of very small government? Think of how upside-down the useless concept of top-down governance will sound to someone in the future? Why allow someone at the very top, someone completely disconnected from who you are and who your neighbors are, to completely control your life, your livelihood and your personal interest. This might be the "WTF" moment in everyone's life at some point in the future. Most of us don't think this way, but imagine if you had to explain to someone in the future as to why you stood by and did nothing about a bizarre top-down dictatorship seeking to control humanity at a global level. Think of how inefficient this is in every way shape and form. Given how incredible humans are, why would they not simply create small, compact and efficient micro-governments or better yet models of self governance to live happy healthy and prosperous lives where they can exercise their own choices? It's like discovering clean renewable energy that can power the world for free and forever and then opting to go backwards in time and use petro-chemical based, pollution-creating, expensive gasoline again. Who would choose this? The same with freedom and mastering your own domain. Close your eyes and truly consider these topics and arguments and think- what can you do to change the world? Start with any of these issues and make sure you can defend your actions someday in the future. Remember that the future is inevitable. It will be here with or without you. The globalist have planned out their future. Have you?